The county distributed a press release on Friday saying it plans to shut off water and sewer services to Pinewood Estates South mobile home park on Jan. 13, 2012, because the owners have refused to pay for the services. The press release says the owners owe the county more than $150,000. Oconee Patch and OnlineAthens used the story that afternoon. The Athens Banner-Herald ran the story on the bottom of its front page on Saturday. As of this evening, the story had picked up 116 comments at OnlineAthens. That kind of a number is unusual. The story at the top of the Banner-Herald’s front page today on a Georgia Bureau of Investigation probe of a personal care home operator who is accused of abandoning four disabled clients in a vacant house over the weekend in Barrow County had five comments by this evening. The Oconee Enterprise is leading its edition tomorrow with the Pinewood Estates South story. The story does have some suspense. The county had had trouble determining who actually owns and controls the property. So who will show up tomorrow at Thomas’ hearing isn’t known at this point. Thomas told me he had been instructed by the county’s legal team not to comment on the hearing or the conflict with the owners of the mobile home park. He did confirm the hearing will be open to the public, as was reported today as well by OconeePatch. A show cause hearing generally is a preliminary hearing to show there is a cause or reason for a charge or complaint, but the hearing tomorrow is in Thomas’ office, not a courtroom. The county filed a formal, legal complaint April 29 in Gwinnett County Superior Court over the unpaid sewer and water bill. Action on that complaint is pending. The complaint names Georgia General Kipling Land LLC and Maxie Price as defendants. The complaint says that Georgia General Kipling Land LLC may be served (notified of the complaint) through its registered agent, R. Lee Tucker, 1555 North Brown Road, Suite 125, Lawrenceville, which is in Gwinnett County. Maxie Price, the complaint states, resides in Bogart and may be served as his residence at 1261 Hammond Creek Trail. The address actually is not in the city of Bogart but off Rocky Branch Road in the northwestern part of Oconee County. “Based upon information and belief Defendant Price is a Manager and Member with controlling ownership of Defendant GA General,” according to the complaint. According to court records, attorneys for both defendants acknowledged receipt of the service. Oconee County contends that Georgia General Kipling Land paid its water and sewer bills for the mobile home park on Old Epps Bridge Road from Sept. 1, 2007, to Sept. 10, 2010, in full and monthly. Georgia General Kipling Land made less than full payment on Sept. 17, 2010, and had $48,436 in unpaid bills when the complaint was filed, according to the document. Initially, the mobile home park owner said the meter readings were wrong and that there was a leak in the line. Oconee County is the plaintiff. “Plaintiff’s records show no communications purporting to offer to provide Defendant or its predecessor in title with water or sewer service at anything other than usual and customary fees,” the county countered. The complaint also states that the mobile home park was approved for only 10,000 gallons per day of sewage usage in 2003 and is currently using in excess of 25,000 gallons per day. At current rates, according to the document, the capacity charge due to Oconee County for usage above 10,000 gallons per day is $142,500. Oconee County is asking the Gwinnett County Superior Court to award it the $48,436 in sewer and water fees plus additional charges for service prior to the time of the trial, plus a 10 percent late fee, plus interest. The county also is asking to be awarded $142,500 for the unpaid sewer capacity fee. It also is seeking undetermined punitive damages and attorney fees. Thomas M. Mitchell is representing the county in the legal action. Most people in Oconee County other than those in Tanglebrook probably know little about Pinewood Estates South. 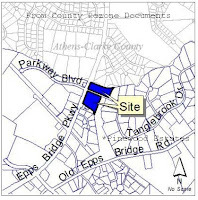 It is tucked between the commercial development on Epps Bridge Parkway and the upscale Tanglebook subdivision. The main entrance to the mobile home park is off Old Epps Bridge Road, which is behind Trader Joe’s and connects to the Jennings Mill Parkway at Home Depot. Old Epps Bridge Road runs dead before it reaches either Loop 10 or McNutt Creek. The main road through the mobile home park is private and does not show up on maps. According to county tax records, Georgia General Kipling Land owns the land that makes up the mobile home park as well as seven additional parcels of land on Pine Ridge Court, which intersects with Epps Bridge Parkway between Jordan Drive and Tanglebrook Drive. It also owns a piece of land across from the mobile park on Old Epps Bridge Road and another piece of land between Tanglebrook Drive and McNutt Creek. That last piece of land used to be a sewage collection pond for the mobile home park. Sewage from the park now runs under Epps Bridge Parkway to the pump station near Kohl’s, Thomas told me when I talked to him yesterday. In May of 2006, Lindsay Greeson, then the owner of the Pinewood Estates South park, sought to rezone the property between Tanglebrook Drive and McNutt Creek as well as part of the mobile home park fronting on Epps Bridge Parkway for a commercial shopping center. Total land for the rezone was just less than seven acres. The map above shows the two pieces of land that were to become the shopping center and the mobile home park tract of which one of these pieces was a part. Property owners in Tanglebrook fought the development on the grounds that it would greatly congest traffic from their subdivision. A bridge across McNutt Creek giving the residents a second exit had been closed. The Oconee County Board of Commissioners turned down the rezone request. According to Oconee County tax records, Georgia General Kipling Land bought the 21 acres that make up the mobile home park from Greeson for $3.4 million in 2007. The property is currently assessed for tax purposes at $1.6 million. The tax records also list 109 mobile homes on the property, some of them owned by Georgia General Kipling Land and others by individuals. Some of these were built in the 1960s, and only one of them was built more recently than 2000. The Census Block in which the mobile home park falls contained 704 residents in 2010, according to the 2010 Census Bureau block data file. Only 318, or 45.2 percent, listed their race as White. The next Census Block, in which much of the Tanglebrook subdivision falls, had 53 residents, all of whom listed their race as White. For Oconee County as a whole, 88.4 percent of the population is White, according to the 2010 Census. The county has scheduled two meetings to address questions and concerns of residents of Pinewood Estates South about loss of water and sewer services. Those will be at 7 p.m. on Nov. 28 and 7 p.m. on Dec. 12 at the Civic Center on Hog Mountain Road. What is the status of property tax payments on this property? If they don't pay for the water, are they paying the taxes? It's a shame that the residents will suffer for the owner's negligence, but our county is owed thousands of dollars which could be used for improvements/jobs in Oconee. The money needs to be collected or the services should be shut off. I fault the owner for allowing this to happen. If he is not receiving the rent he asked for from the residents, then the residents need to find another place to live. Why should all suffer because of "some?" Tracye Bailey in the Oconee County Tax Commissioner office told me a few minutes ago that the property taxes for the mobile home park are up-to-date, having been paid on Nov. 14.